That’s right — how would you like to take a free trip to New Orleans? Even better yet — what if I told you there shall be no fretting over tedious packing, carrying heavy luggage, airline surcharges, or even gas cost? No budget needed for dining out or worries of what to do with pets & children. You must be wondering why or how by now – well DIY City Mag recently launched their new New Orleans issue! Go grab a cup of tea, coffee or whatever your favorite vice is & take a gander over there to peruse the lovely pages. It really is like taking a virtual vacation. Don’t worry, it’s free to read online – and I am positive you will find oodles of inspiration and artistic discoveries within it. 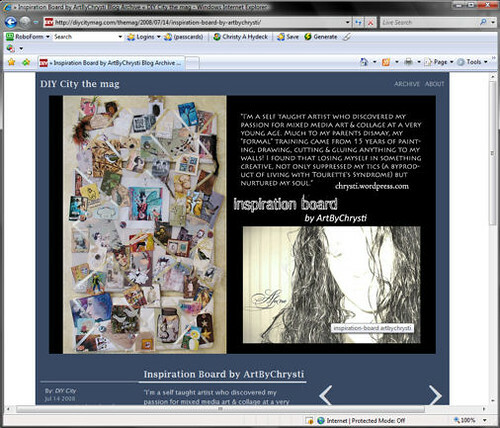 They were even nice enough to feature my inspiration board (an older version then what I have up now) and one of my self-portraits in it. I’m so glad they asked me to be a part of this, as I may not have heard of them otherwise – now you won’t have that excuse! Lastly, PLEASE take a look at my inspiration board on Flickr to see the talented artists who created the art which adorns it: they deserve the recognition too. So whatcha waitin’ for? Go visit New Orleans! P.S. 4 days in a row … yup, count ’em – 4 – now I have posted. Where’s my prize? P.P.S. Today was a rather rough one for moi. I did however notice how pretty the rust on my antique hardware is in my bathroom; and I did rediscover the simple joys of my pets – how my Sophie’s neck twists just so, or how big Callie’s eyes get in excitement when she is pet, how Morgan just lives to make me happy, and the tender kisses my older dog Sadie gives. I found myself grateful for the simple joy a fine tipped pen brings me as well.. taking the time to focus on the simple pleasures, truly helped ease my otherwise foul mood a bit. Did you try find the extra-ordinary in the ordinary today? Be sure to look around, and enter my contest! :) love the post! Raleigh – how big of a city is Raleigh, we have a little surprise for our 1 yr issue…so let me know about your city – a little hint looking for a small town. seems to me Raleigh may be bigger than a small town. I need to be with my family their.